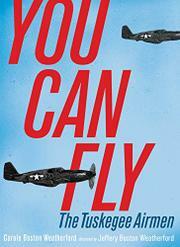 The story of the struggles and achievements of the Tuskegee Airmen is told in vivid informational poetry. Pre–World War II efforts aimed at improving the opportunities for African-Americans in the military faced strong opposition, but flight programs such as Tuskegee’s had a strong advocate in Eleanor Roosevelt, and she convinced President Franklin D. Roosevelt to support them. The preparation was vigorous, under the direction of white officers who were also affected by the racism of the time: “For them, choosing Tuskegee / means never making general, / but making history instead.” The poems explore all aspects of the time spent in training, including the restrictions of a small Southern town as well as outside news. After the U.S. entered the war, the pilots were eventually allowed to participate and served with great distinction. Carole Boston Weatherford does a masterful job of portraying the era and the prevailing attitude among African-Americans, who believed they could overcome racism with excellence. Her skill with language provides clear voices for the trainees, and cultural specifics provide additional texture and deepen understanding of the young men. Even African-American military nurses make an appearance. The epilogue places the Tuskegee Airmen in context with other, defeated legal racial barriers. This excellent treatment is enhanced with useful backmatter: author’s note, timeline, and list of additional resources. Jeffery Boston Weatherford's scratchboard illustrations complement the text.